The 2019 Toyota Camry Hybrid in its eighth-generation has grown up in dimension and has received major styling and design updates. The 2019 Toyota Camry Hybrid is underpinned by the new TNGA platform. The eighth-generation Camry Hybrid has received major styling updates. The new Camry Hybrid is underpinned by the new TNGA platform. The 2019 Toyota Camry Hybrid has been launched in India and the Japanese carmaker has impressed us with the pricing this time. While we were expecting the all-new Toyota Camry Hybrid to be a couple of lakhs more expensive than the outgoing model given that it has received a significant update, at ₹ 36.95 lakh (ex-showroom, India) Toyota has managed to price it ₹ 27,000 cheaper than the previous model which was priced at ₹ 37.22 lakh (ex-showroom, India). The aggressive pricing seems even more impressive considering the fact that the government has withdrawn the incentives on Hybrid models and has imposed 48 per cent GST on them, in line with all the other models which measures above four metres and have an engine capacity of over 1.5 litres. Read on to find out what all the all-new Toyota Camry Hybrid offers in its price range. The eighth-generation Toyota Camry Hybrid is built on the Toyota New Global Architecture (TNGA) aka GA-K platform which also underpins the latest Lexus ES. The new platform has made the new car more rigid along with enabling Toyota to redesign the steering system and suspension set-up in a bid to enhance the stability of the new model. There have also been alterations in the dimensions of the new Camry Hybrid. It is 29 mm longer measuring at 4885 mm, the wheelbase has increased by 77 mm at 1852 mm and it's 15 mm wider at 1840 mm. However, it is shorter by 25 mm now at 1455 mm. 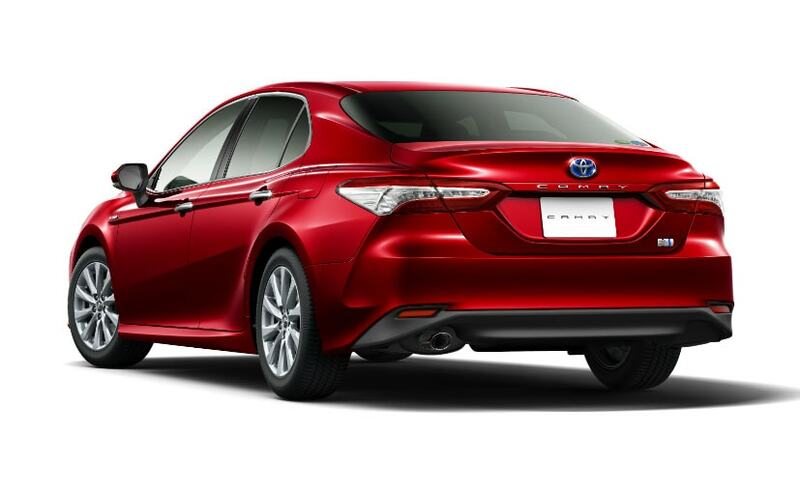 The rear of the new Camry hybrid looks edgier embodying sharper profile lines. The 2019 Camry Hybrid is a significant departure from the previous model in terms of design and looks way sharper now following Toyota's new 'Keen-Look' design language. The new front is in line with Toyota's family face housing a massive and peculiarly wide grille above which is the 'V' nose like the one seen on the latest Corolla Altis and Yaris. The bonnet is even more sculpted and stretched back headlamps look a lot edgier. The pronounced character line is carried even to the side profile and flows over the haunches towards the rear where it merges into the boot-lid forming a boomerang shape right above the taillamp cluster. The rear altogether looks more dramatic with wraparound taillamps and a large diffuser finished in matte black which are complemented by a sharp profiling. The most alluring design element inside is the lightning bolt sort of structure which adjoins the dash and the central console. 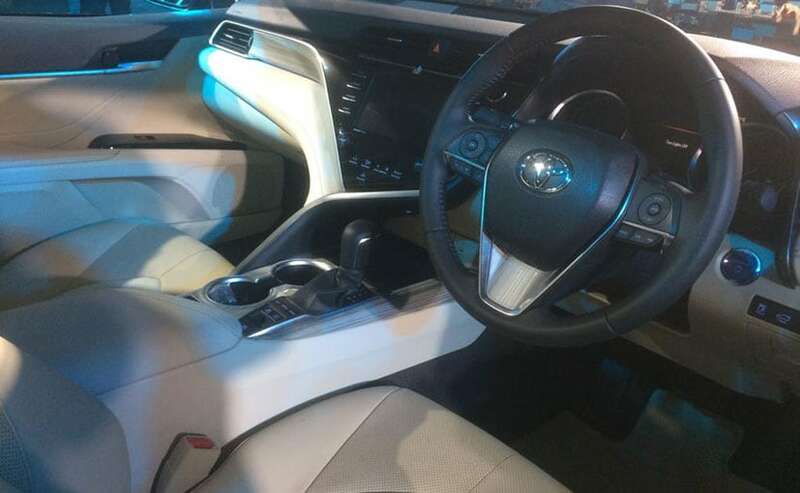 The cabin of the 2019 Camry Hybrid is all new and the flat design of the dash looks a tad similar to that of the Innova Crysta's. The interiors have black and beige colour theme and the upholstery is finished with soft-touch materials. 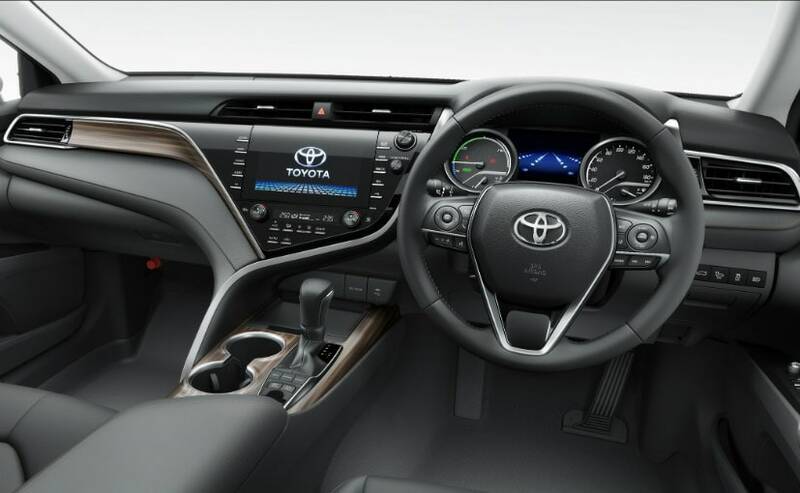 Moreover, wood inlays on the dash and door pads and faux chrome treatment on the sporty looking three-spoke steering wheel and high raked central console add to the plush quotient of the new Camry Hybrid. But, the most alluring design inside is the lightning bolt sort of element which adjoins the dash and the central console. The increased wheelbase and dimensions have enhanced the space at the rear. The cabin of the 2019 Toyota Camry Hybrid is practical having plenty of storage space like sufficient size cup holders in the central console, storage space to keep mobile phones along with other handy stuff and bottle holders in the doors which are big enough to hold one-litre bottles. 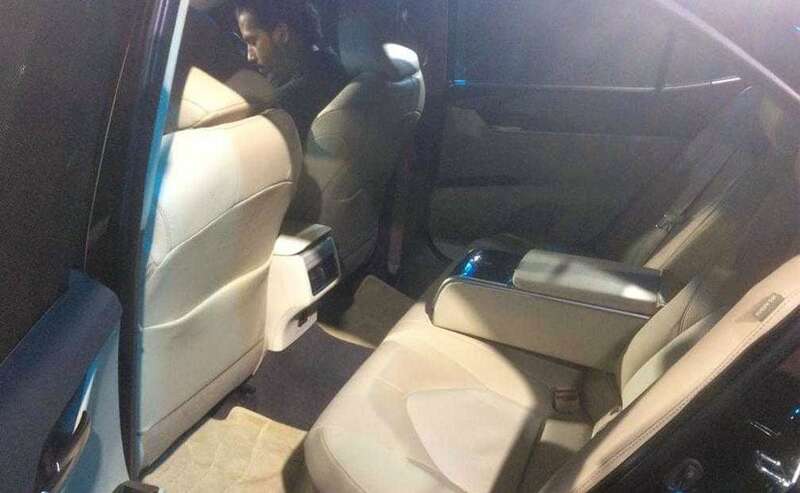 Since the wheelbase has increased by a significant margin and it's wider too, there is a better sense of space inside with aplenty legroom to stretch out and to top it all, the seats even in this new one recline and have the trunk access. The new Camry Hybrid gets a larger infotainment screen connected to a JBL sourced 9-Speaker Dolby sound system, wireless charging, cruise control, sunroof, 3-zone climate control, memory assist seats and more. The previous-generation Toyota Camry Hybrid was well loaded and this new model has taken that just a step ahead. To count the major ones, the new Camry Hybrid gets a larger 8-inch infotainment screen with onboard navigation and Bluetooth connectivity, however, no Apple CarPlay and Android Auto which is a big miss. But it now gets wireless charging and an advanced 10-inch heads-up display. Moreover, it continues to be packed with premium features like a sunroof, three-zone climate control, memory assist for driver seats and ORVMs, rain sensing wipers, cruise control, Electronic Parking Brake and more. The eighth-generation Toyota Camry Hybrid continues to use the same drivetrain, however, power figures have upgraded. It is powered by the 2.5-litre, four-cylinder, petrol mill which is coupled with an electric motor to churn out 215 bhp in combination. The petrol engine produces 176 bhp at 5700 rpm and 221 Nm at 5200 rpm. The electric motor develops 118 bhp and 202 Nm. The powertrain is mated to a six-speed CVT gearbox which in-turn sends power to the rear wheels. 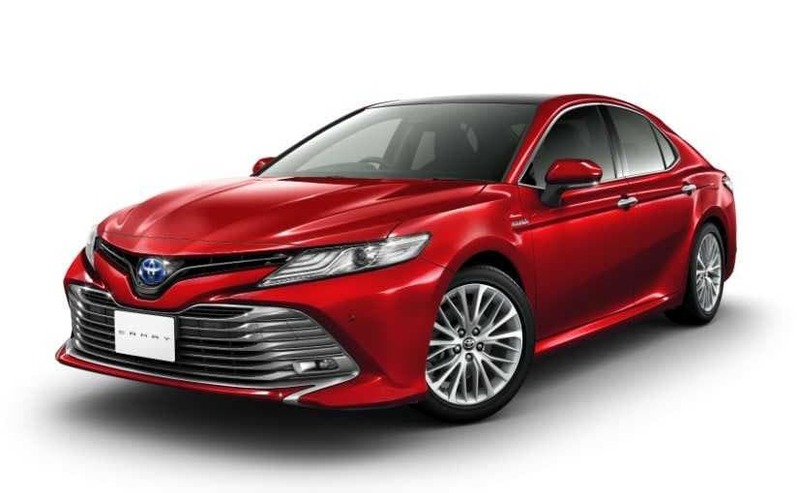 2019 Toyota Camry gets 9 airbags as standard. Toyota cars have been well known for their robust build quality and we have already mentioned that the new platform has made the Camry Hybrid even sturdier. The Japanese carmaker offers seven-airbags even in its mid-size sedan- the Yaris and the Camry being the premium executive sedan is expected to be up in the game. The 2019 Camry Hybrid is laden with all the segment standard safety features like ABS with EBD, Stability Control, Traction Control, Hill Hold function and it gets 9 airbags as standard.